Our residential new construction department is capable of quality air conditioning systems installation in all housing markets. 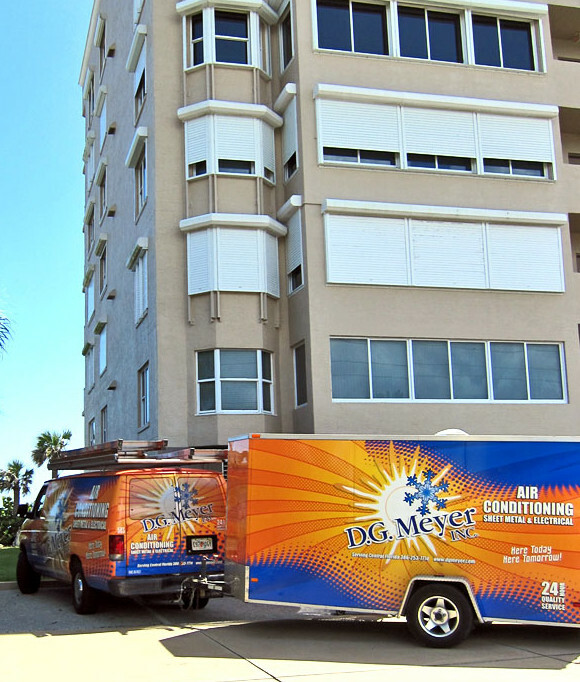 From basic standardized models in this area’s highly competitive markets, to exclusive custom homes, D. G. Meyer, Inc. has the most cost effective solution to meet any homeowner’s needs. No job is too big or too small to be handled by our experienced, trained technicians. A full compliment of tools and resources allows us to ably implement the latest in technological advances, such as zone systems and indoor air quality controls, and provide our customers with a complete package of home comfort. 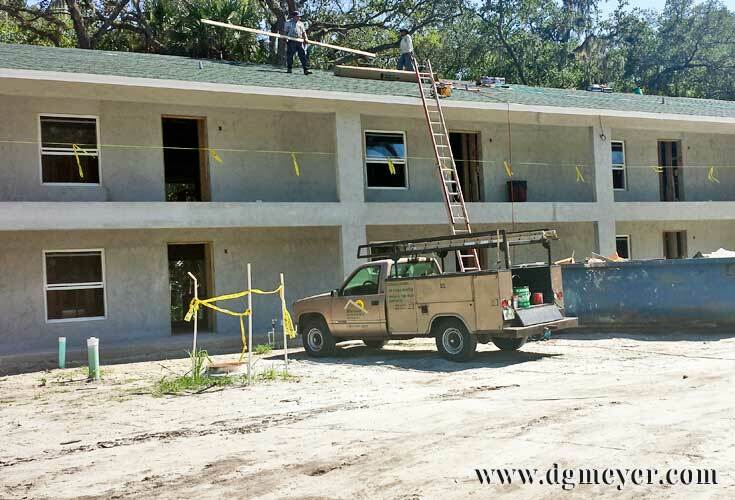 Grand Oaks Apartments in New Smyrna Beach! Our customers appreciate our one-on-one style of doing business. We are never too busy to answer our customer’s concerns and are always happy to meet with new homeowners and contractors to discuss their concerns. Four apartment buildings and a clubhouse using a total of 148 HVAC systems and dryer/bath venting. Eagle Landing Apartment Job Site. four apartment buildings and a clubhouse using a total of 148 HVAC systems and dryer/bath venting. Eagle Landing Work Site. TJ and Alan operating the lift. Eagle Landing Apartments. DGM workers installing dryer vents. Job site at Eagle Landing. DGM workers on lift. Duct-work inside the ClubHouse at Eagle Landing Job Site. Outside View of Eagle Landing Apartment Complex Construction site. Crane’s Eye View of Construction Project. 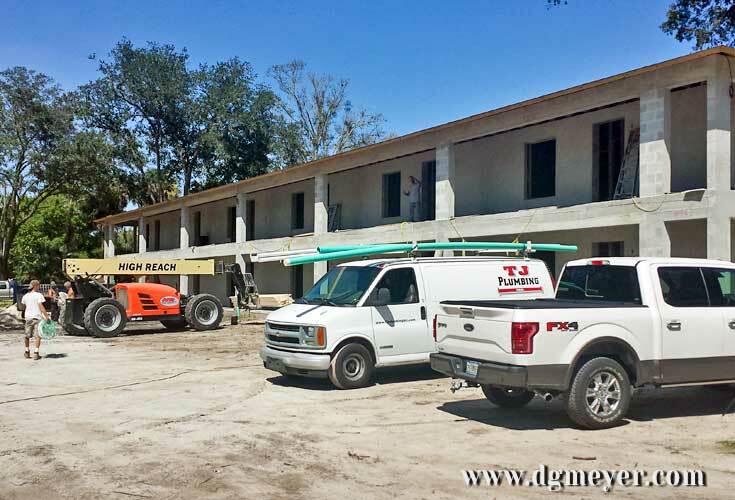 DGM Equipment at Eagle Landing Apartment Project. Eagle Landing Project near completion. Eagle Landing Project with HVAC units in place. Streetview of Eagle Landing Units .